Scalable PA system with 400W continuous output. 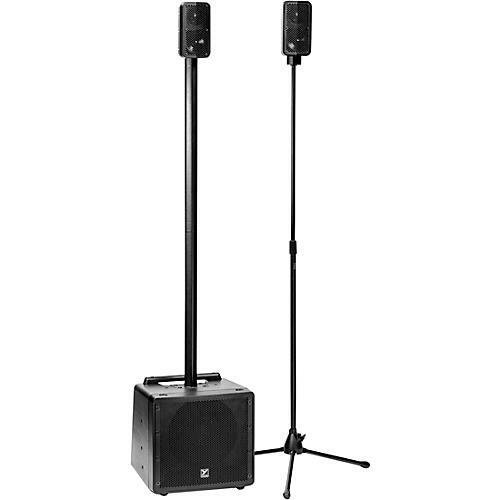 Bringing a new level of versatility and flexibility to portable, all-in-one column-style PA speaker systems, the Yorkville EM400 is ideal for DJs, soloists and other mobile performers. What makes the EM400 personal line array loudspeaker unique is that it can be stripped down to a minimal, ultra-compact package with one satellite speaker without a speaker pole, or expanded to utilize the second satellite speaker with two different pole heights. Designed for maximum mobility, the foundation of the scalable EXM400 column-style PA system is a compact powered subwoofer module with integrated mixer. Two high efficiency satellite speakers and two speaker poles complete the core package. Connectivity between subwoofer and satellite speakers is handled with innovative pole through conductors, meaning no extra cabling is required. Power, portability and versatility—order today. HF driver:	4 x 3.5"